A New Year! A New Start! A great time until one needs to change those big plans. Mistakes and u-turns, ripping out progress in disappointment has been my theme so far this year. I LOVE the summer sweater/shawl pattern from an issue of Keitodama 157 I purchased last summer. It has been at least six months of looking for the perfect yarn in the perfect color and a soft linen sample I found at Keito seemed to be the perfect fit. Until I got home and started crocheting. The lovely linen sample in the store is completely different than the thick twine-like linen from the spool I received. Sure I could use it for a nice crocheted bag. 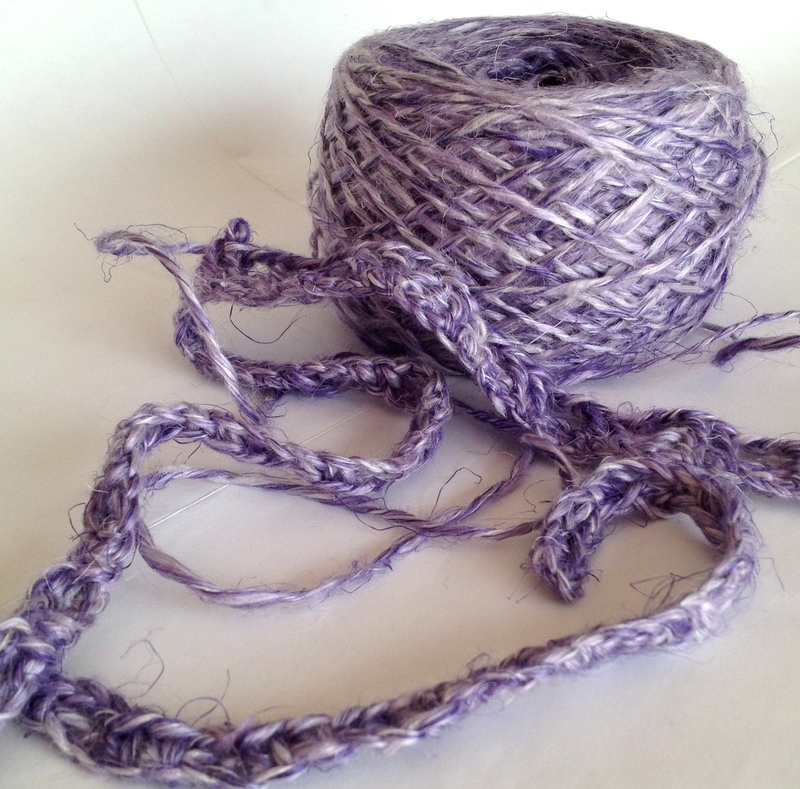 Not a total waste but I can’t start the sweater until I find that exact linen in that exact shade of khaki lavender! My local Okadaya shop sells the yummiest, softest little skeins of baby alpaca in the most beautiful colors. Already made a super warm scarf in the shades of purple skeins I had purchased and thought the same yarn would be wonderful to make a lovely lace scarf for shoulder seasons here. Now that I’ve crocheted almost a whole skein of it, I’m not really loving it. The photo in the Keitodama issue (yes, the same issue as the aforementioned sweater) is so well done. My effort just looks like a fuzzy pink spiderweb. I really don’t like spiders. I just recently received my latest shipment from Solar Flair Fibre’s Rainforest to the Reef yarn club. 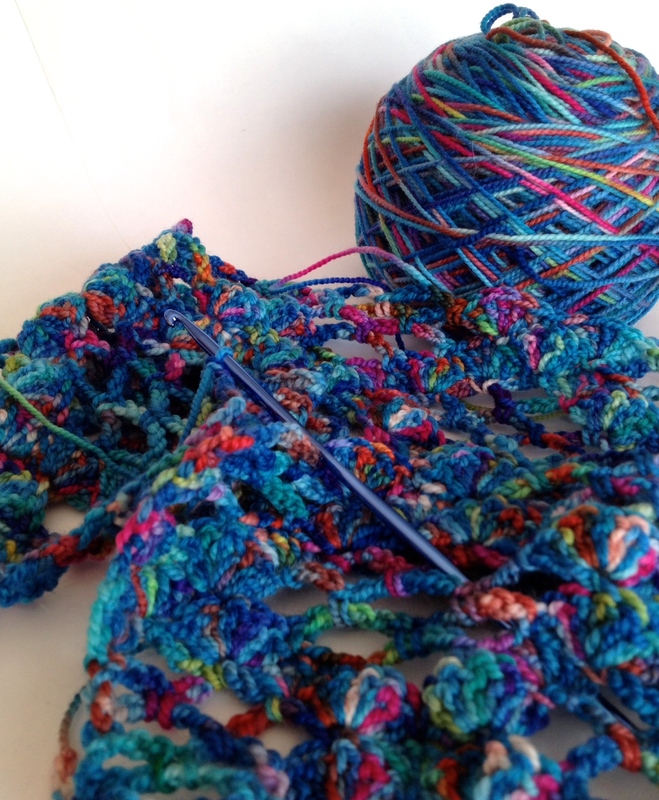 The Under the Sea colorway is a gorgeous blue with great pops of color from a mix of merino, cashmere and nylon. Immediately caked it up and found a great rectangular shawl pattern and started on it right away. At approx 30″ wide, I don’t have enough yarn to create it in the length mentioned in the pattern! So having done at least 6″ of the length already I need to rip it all out, start over in a smaller width. ouch. I really like the Beachcomber Shawl Pattern I chose so I still have that. One good bit of news is that in my search for the perfect pattern for the Under the Sea colorway, I was able to find the perfect pattern for last month’s club shipment. January = Lots of work completed, Lots of work ripped out. Hopefully my yarn/pattern choices will improve quickly!